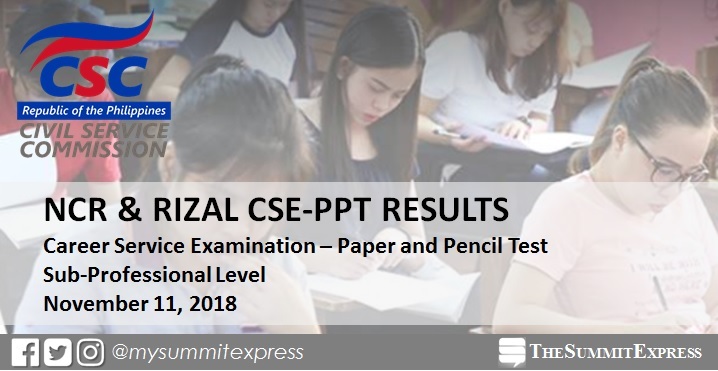 MANILA, Philippines – (Updated January 4) The Civil Service Commission(CSC) released within two (2) months the full result of November 11, 2018 Civil Service Exam- Paper and Pencil Test also known as Career service examination, a reset of the suspended CSE-PPT in August, administered in the National Capital Region (NCR) and Rizal. On Friday, January 4, CSC announced that 818 of the takers in NCR while 47 examinees in Morong, Rizal successfully hurdled the test. CSC decided to reschedule the exam set on August 12, 2018 due to torrential rains brought by the southwest monsoon (Habagat). The complete list of passers for sub-professional level examination for NCR and Morong, Rizal is available below. It is open to Filipino citizens, regardless of educational attainment, who are at least 18 years old at the time of filing of application, and have not taken the same level of examination within three months before the date of examination. The Sub-Professional test has 145 items in English and Filipino (numerical ability, verbal ability, as well as general information items such as on the Philippine Constitution, Code of Conduct and Ethical Standards for Public Officials and Employees (Republic Act No. 6713), peace and human rights issues and concepts, and environment management and protection). It has the same scope as the Professional test, except analytical ability, but includes questions on clerical ability.